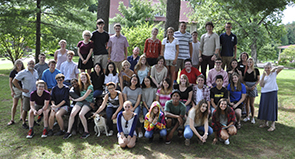 Opening events for St. Andrew's-Sewanee School's 2016-17 school year begin on Wednesday, August 17 with the Middle School New Family Gathering. On Thursday, August 18, new boarding students move on to campus and all students new to the Upper School begin orientation. Orientation continues through Friday. Returning boarding students move in on Saturday, August 20. Senior parents meet that morning with Director of College Counseling Christine Asmussen to kick off the college application season. Also on Saturday, Middle School parents and returning parents come to campus for presentations and advisory meetings. All students will participate in orientation activities on Saturday. Throughout the opening activities, students and parents will have several opportunities to meet the new Head of School Karl J. Sjolund. Mr. Sjolund will speak to gatherings on Wednesday, Thursday, and Saturday, and will host two receptions for parents at his campus home. Orientation and opening activities for parents also include meetings with their child's house parents and advisors, training on the school's learning management system, and information on health services, music and dance lessons, Sewanee Symphony Orchestra participation, afternoon programs, and learning resources. Faculty and staff are assisted throughout the opening events by student Proctors and Ambassadors. On Monday, August 22, the student body will gather at 8 a.m. for its first all-school Eucharist in the school's newly renovated Chapel. SAS welcomes 64 new students this year, including 28 boarding students, 9 Upper School day students, and 27 Middle School students.